During the summer and fall this year, me and my colleague Terje Sandstrøm has worked together on a book project that has now finally hit the stores! 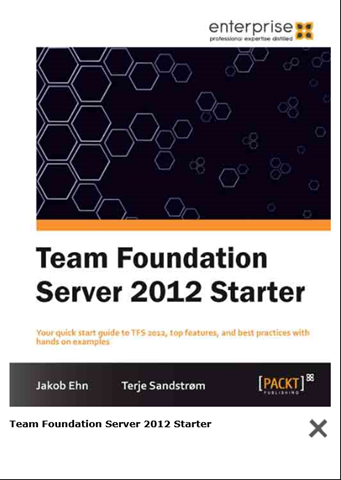 The title of the book is Team Foundation Server 2012 Starter and is published by Packt Publishing. The book is part of a concept that Packt have with starter-books, intended for people new to Team Foundation Server 2012 and who want a quick guideline to get it up and working. It covers the fundamentals, from installing and configuring it, and how to use it with source control, work items and builds. It is done as a step-by-step guide, but also includes best practices advice in the different areas. It covers the use of both the on-premises and the TFS Services version. It also has a list of links and references in the end to the most relevant Visual Studio 2012 ALM sites. Our good friend and fellow ALM MVP Mathias Olausson have done the review of the book, thanks again Mathias! you think of the book! Team Foundation Server 2012 is Microsoft’s leading ALM tool, integrating source control, work item and process handling, build automation, and testing. This practical “Team Foundation Server 2012 Starter Guide” will provide you with clear step-by-step exercises covering all major aspects of the product. This is essential reading for anyone wishing to set up, organize, and use TFS server. software development projects. Manage your team projects with Team Explorer, one of the many new features for 2012. Tools for planning your product and sprint backlogs. 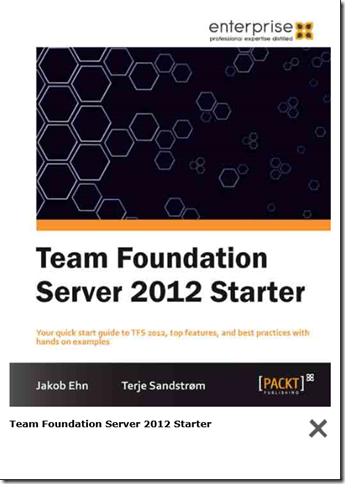 “Team Foundation Server 2012 Starter Guide”. This Starter guide is a short, sharp introduction to Team Foundation Server 2012, covering everything you need to get up and running. Author Jakob EhnPosted on November 29, 2012 Categories TFS, Visual Studio 2012Leave a comment on Book “Team Foundation Server 2012 Starter” published! Extensions and addins are everywhere in the Visual Studio ALM ecosystem! Microsoft releases new cool features in the form of extensions and the list of 3rd party extensions that plug into Visual Studio just keeps growing. One of the nice things about the VSIX extensions is how they are deployed. Microsoft hosts a public Visual Studio Gallery where you can upload extensions and make them available to the rest of the community. Visual Studio checks for updates to the installed extensions when you start Visual Studio, and installing/updating the extensions is fast since it is only a matter of extracting the files within the VSIX package to the local extension folder. But for custom, enterprise-specific extensions, you don’t want to publish them online to the whole world, but you still want an easy way to distribute them to your developers and partners. This is where Private Extension Galleries come into play. 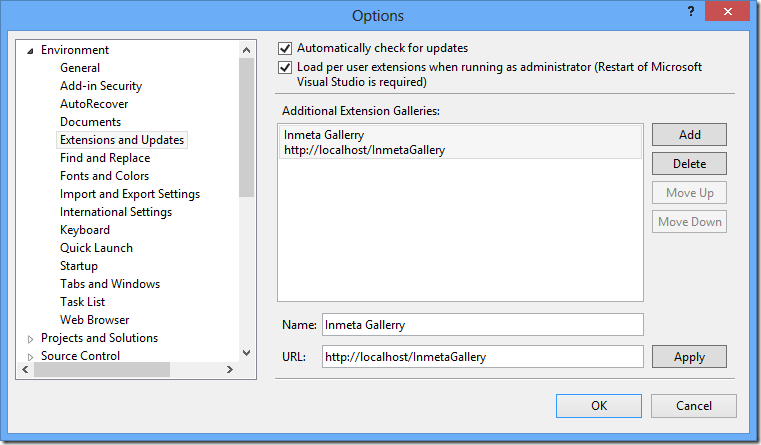 In Visual Studio 2012, it is now possible to add custom extensions galleries that can point to any URL, as long as that URL returns the expected content of course (see below).Registering a new gallery in Visual Studio is easy, but there is very little documentation on how to actually host the gallery. 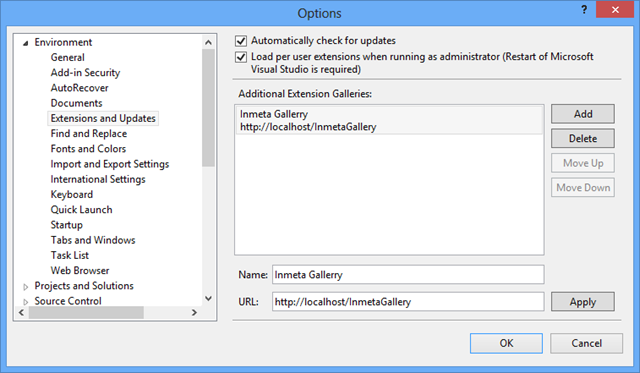 Visual Studio galleries uses Atom Feed XML as the protocol for delivering new and updated versions of the extensions. This MSDN page describes how to create a static XML file that returns the information about your extensions. This approach works, but require manual updates of that file every time you want to deploy an update of the extension. Wouldn’t it be nice with a web service that takes care of this for you, that just lets you drop a new version of your VSIX file and have it automatically detect the new version and produce the correct Atom Feed XML? Here you can see that in addition to the standard Online galleries there is an Inmeta Gallery that contains two extensions (our WIX templates and our custom TFS Checkin Policies). These can be installed/updated i the same way as extensions from the public Visual Studio Gallery. The service uses ASP.NET MVC 4.0, so make sure that you have this installed on your web server. 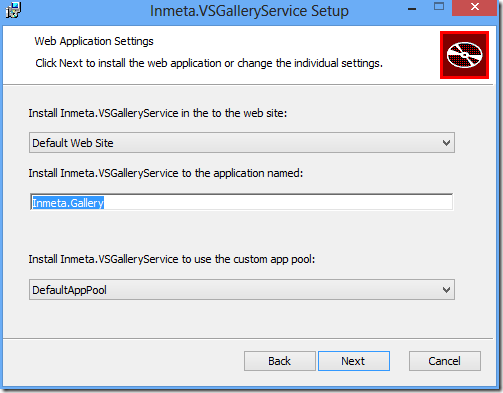 Download the installer (Inmeta.VSGalleryService.Install.msi) for the service and run it. The installation is straight forward, just select web site, application pool and (optional) a virtual directory where you want to install the service. Press Next and finish the installer. I hope that you will find this sever useful, please contact me if you have questions or suggestions for improvements!